2020 will be the 60th anniversary of the first publications using the cut-up methods developed by William Burroughs and Brion Gysin at the Beat Hotel in Paris. To mark this landmark in cultural history, we are organising CUT-UPS@60, an international Cut-Up Conference in London and Paris in September 2020. 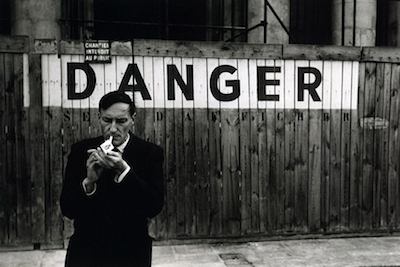 With two days of events in each city, the conference will be a major multidisciplinary occasion to examine the past and explore the ongoing legacy of the connections that Burroughs’ work in particular made between artistic and social radicalism. We envisage a series of talks, workshops, exhibitions, and performances in film and music (remix, sampling, mashup), literature and the arts (collage, chance), politics (détournement as ideology critique), sexual identity (therapeutic deconditioning), philosophy (deconstruction of language), social movements (participatory activism), the occult (divination, exorcism), and science (virus/genetic research). The legacy of cut-ups goes beyond the A to Z of artists famous for using its methods, from Kathy Acker to John Zorn by way of Sinclair Beiles, David Bowie, Jan Herman, Harold Norse, Claude Pélieu, Jürgen Ploog, Carl Weissner, Terry Wilson, and we hope to see the literally cutting-edge new work being done in any field inspired by cut-ups, to bring together the unlimited potentials unleashed by the Stanley knife that Gysin put into Burroughs’ hands in Paris 60 years ago. The conference looks to the future and will also be a major retrospective, featuring a triple book launch: a cut-up trilogy of incendiary pamphlets with expanded 60th anniversary editions of Minutes to Go and The Exterminator, and a never-before-seen handbook of guerrilla tactics assembled from recently discovered archival sources, BATTLE INSTRUCTIONS. The new text, as fresh and ferocious as when it was created, reveals Burroughs the experimental artist and political radical at his most revolutionary. We welcome proposals for any input that carries on the work of cut-ups. This call will remain open until April 2019, but with limited space in the conference programme we invite you to express your interest as soon as possible in either or both the London and Paris venues. Further information will be posted on this site. And if you are planning your own events, please link up to make 2020 a cut-up year to remember. Posted by RealityStudio on 17 April 2018. It will be interesting to see the enthusiasm for a style which has of late, declined. Please keep me posted on both dates. Thank you! Stephen, I think there will be a lot of interest. There are still people using cut up as a writing technique. Likewise in music and visual art. I’m rather looking forward to going. Sad to note Sinclair Beiles is missing. He was one of the trinity in Minuyes to Go. Just because Sinclair was the First Man in Space, doesn’t mean he was never on Earth. We are all Known Unknowns because we know these things. Is there a way to subscribe to future posts by this group?